I've found that the best digital photography books are ones that don't try to overwhelm you with technical knowledge. Instead, they take a stepwise, practical approach and teach you concepts and general "rules" rather than the inner workings of your camera. 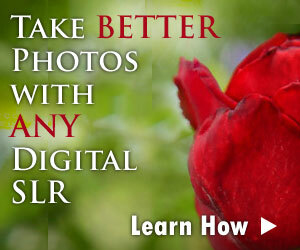 Here's the thing with digital SLR cameras: there's always something new to learn. I have been using them extensively now for 5 years (since the very first digital SLR from Canon was available), and there are still many techniques and tricks that I have yet to master. So what do I do when I want to learn something new? I find the best digital photography book on the subject I'd like to know more about then I read, learn and practice from there. I can't stress enough how important it is to practice anything new you learn with your camera. All digital SLRs are slightly different from each other, and a digital photography technique that works well for one camera won't be ideal for another. This is why if you really want to learn something new, it's not enough just to read the best digital photography book on the subject. You must practice the skills explained in the book with your own camera. Once you've had the chance to practice a new technique with your own camera and can see the results, then the information presented in the book really becomes clear. I recently read a great book on posing people for portraits and felt that I had a good handle on the material. However, it wasn't until I tried to photograph 7 people all at once that the techniques explained in the book really sunk in. It was immediately clear to me why the author noted that posing 5 or more people and getting them all to look good at the same time is a massive challenge. Enough preaching about practice. Let's talk about some of the best digital photography books you can get your hands on. Camera guides are a great starting book when it comes to digital SLR cameras. If this is your first digital SLR (or first SLR of any kind) then you'll want to be familiar with all of the controls that your camera has to offer. The best digital photography books in this category act as an alternative to the camera's manual, which can sometimes be quite difficult to understand (since many suffer from poor foreign language translations). I am a huge fan of landscape photography. There is something about sweeping scenic vistas ablaze with color that makes me sit up and take notice. I knew when I was starting out that I was going to need some help when it came to my landscape photos if I wanted to improve their quality. Happily, I was able to find some. The best digital photography books for portrait work that I've found are packed with photos. While a lot of the landscape photography concepts can be grasped without a photo to illustrate, understanding portrait work really requies good photo examples. Moreso than any other style of photography, the quality and tone of a portrait can be changed by making tiny adjustments. Whether these adjustments are to the lighting setup or the pose of your subject, good photographic examples will help you learn the concepts that much faster. I've talked about some of the best digital photography books for specific subjects. Now let's broaden our horizons and generalize things a bit. Sometimes you don't want to learn a specific style of photography, you just want to understand how your camera works. The books in this section tackle the overall topic of "photography" instead of focusing on a specific camera model or type of photograph.